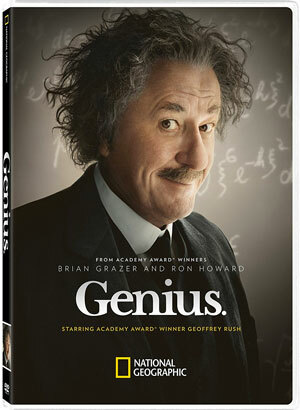 Twentieth Century Fox Home Entertainment has added the National Geographic television event Genius to its line-up, scheduling a DVD version for release in April. From executive producers and Academy Award® Winners Brian Grazer and Ron Howard, National Geographic’s first-ever scripted series, Genius, offers an extraordinary look into the life of Nobel Prize-winning physicist Albert Einstein. Academy Award® Winner Geoffrey Rush stars as the rebellious daydreamer who became the greatest scientific mind of the 20th century. Beyond his groundbreaking theories of relativity, you’ll witness Einstein’s struggles to be a good husband and father, and a man of principle during a time of global unrest. With Johnny Flynn as young Albert and Emily Watson as his second wife, Elsa, Genius takes you on an unprecedented, 10-episode journey of discovery guided by Einstein’s wit, wisdom, and insatiable thirst for knowledge. In addition to all 10 episodes, the release will also include a series of short Featurettes highlighting various aspects of the production, such as ”Meet the Characters,” “Einstein’s Love Life,” “Einstein’s Escape from Hitler,” “The Making of Genius,” “Behind the Scenes with Ron Howard and Brian Grazer,” “Behind the Scenes with the Cast,” “Costumes and Makeup,” “What Does “Genius” Mean?”, and ”Two Einsteins”. Genius will be in stores on April 17 for $28.98. No high definition versions have been announced.